Cardiff City will host Chelsea FC in Premier League action this Sunday as both teams are battling for their fate at different ends of the table. However, neither side is coming into this match with consistent form. Cardiff won their last match against West Ham on the back of three earlier defeats. Meanwhile, Chelsea were underwhelming in their last outing against Everton where they lost 2-0. Cardiff are underdogs for this match and are priced at 6/1 to win by SkyBet. Cardiff have showcased a lot of fighting spirit after a tricky few months off the field for them. Their 2-0 win over West Ham has given them a chance to escape out of the relegation zone with a win on Sunday. Amongst the goals in their last match was Spanish midfielder Victor Camarasa. He has four goals for the season and is 4/1 to score anytime. Chelsea are priced at 4/9 to win this match. Maurizio Sarri is having a tough time trying to cement a top four place, with Chelsea currently sixth in the league. There are just four points between them and Spurs in third, so we are sure to have a great final day of the season with so many teams still fighting for a top four spot. The Blues are fortunate that Eden Hazard has been electric this season otherwise they wouldn’t have won nearly as many matches. The Belgian has scored 13 goals this season and is 16/5 to open the scoring this Sunday. The reverse of this fixture earlier in the season saw Hazard grab a hat trick, he is 28/1 to repeat that feat. The referee for this match will be Craig Pawson. The official has averaged 43.1 booking points this season. When these two met earlier in the season when Chelsea won 4-1, there wasn’t a single card shown all match. 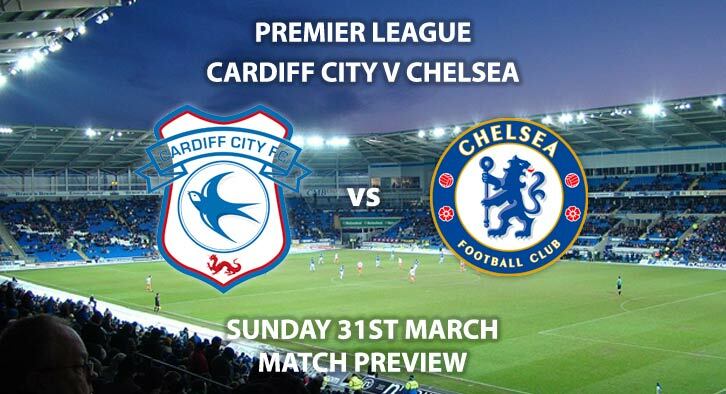 Cardiff City vs Chelsea will be televised on Sky Sports Premier League HD and kicks off at 14:05. – Chelsea have too much quality but given their inconsistency this won’t be an easy win. First Goalscorer – Eden Hazard – (link no longer available). Player shots on targets – Victor Camarasa 1+ shot on target – 6/4. Popular Player Stats RequestABets – Higuain to score a header and Hazard to score from outside the area – 300/1. RequestABet Specials 33/1 to 66/1 – Hazard & Higuain to score and Chelsea 2-0 – 33/1. RequestABet Specials Up to 10/1 – Chelsea to score 2+ goals, 5+ Chelsea corners and 20+ Cardiff booking pts – 9/4. Odds and markets last updated on Sunday 31st March @11:19 GMT. Keep checking back to see if there’s any updates to markets – the time stamp in the previous sentence for when we update tips on this page will be updated.